Inbound means streetcars going toward Fisherman's Wharf. Outbound means streetcars going toward Castro. 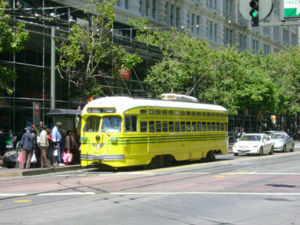 F line is one of two historic streetcar lines in San Francisco and uses actual historic vehicles of different eras. Some F line trips operate only between the Ferry Building and Fisherman's Wharf. Because of he popularity of the line, additional service is provided by buses on the same route making the same stops. For some major events, E-Embarcadero historic streetcar line will operate between Fisherman's Wharf and Caltrain via the Ferry Building. Cash riders need to board through the front door and pay the fare at the farebox. Riders with a valid transfer, pass, or Clipper card can board through any door (Clipper users need to tap card when boarding). The Streetcar fare is the same as Muni Metro and buses. Riders without a valid proof of payment is subject to citation. The streetcars do not have bicycle racks and do not allow bikes onboard. Stops with a smaller dot are not wheelchair accessible. Muni Metro and BART run under Market Street. Streetcar is accessible at all stops between the Ferry Building and Fisherman's Wharf via wayside ramps, and at most stops on Market Street with wayside ramps or lifts. At stops with ramps, passengers in wheelchairs or other mobility devices should wait on the top of the ramp. At stops with lifts, passengers should wait on the lift platform and press the "up" button to raise the lift when the streetcar arrives. This page was last edited on 10 January 2019, at 22:54.